FORSKOLIN EXTRACT & GARCINIA CAMBOGIA | One 90 Count Bottle of Each | Forskolin 250mg 20% Extract | Garcinia 1500mg 75% HCA | Max Diet Formula For Losing Weight* | Free Shipping! 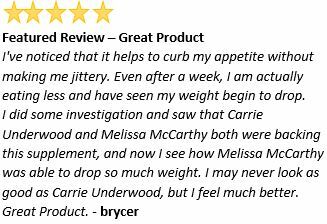 Diet Product Of The Stars... Blake, Adele, Rachael, Jessica! Maximum Strength 750mg Per Capsule! 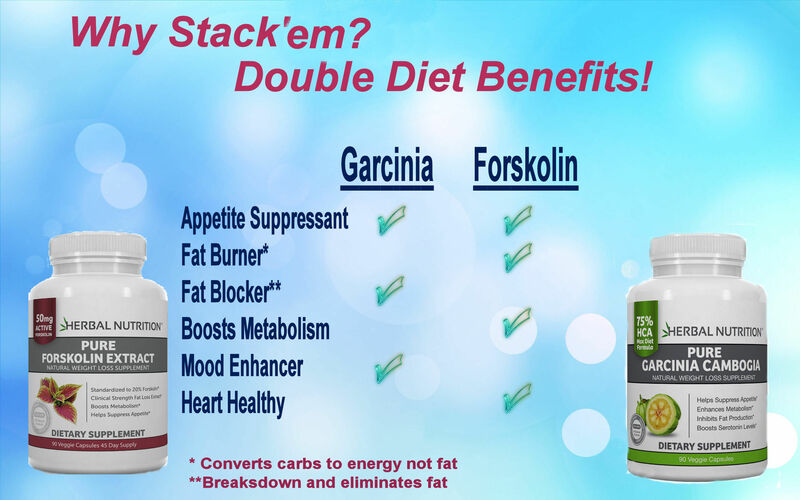 NATURAL WEIGHT LOSS STACK FORSKOLIN TAKEN WITH GARCINIA CAMBOGIA. "Stacking" is a term for taking multiple supplements at the same time that work toward the same goal. Forskolin and Garcinia use different mechanisms and actions within the body to aid in dieting and weight loss. So why not take advantage of them at the same time. A POTENT DUEL DIET STACK ATTACK! COMPONENT ONE - FORSKOLIN EXTRACT is a 20% EXTRACT of the COLEUS FORSKOHLII plant. Two CAPSULES per day help in LOSING excess pounds FAST. These strong FAT BURNING capsules melt away the pounds in a NATURAL way. 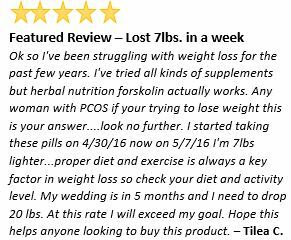 FORMULATED at the perfect dosage for weight loss – 250mgs of Forskolin per day resulting in 50mgs of pure extract! COMPONENT TWO - GARCINIA MAX DIET FORMULA is 1500mg PER SERVING In two 750mg capsules with 75% HCA. 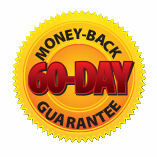 At 750mg our capsules provide 30% GARCINIA & MORE FOR YOUR MONEY. Garcinia provides APPETITE SUPPRESSION and BLOCKS FAT STORAGE. It INCREASES SEROTONIN LEVELS which will improve mood while dieting! YOU CAN TRUST THE HERBAL NUTRITION BRAND! Our goal is to help people improve the quality of their lives, by providing nutritional supplements that will benefit their health and athletic performance. 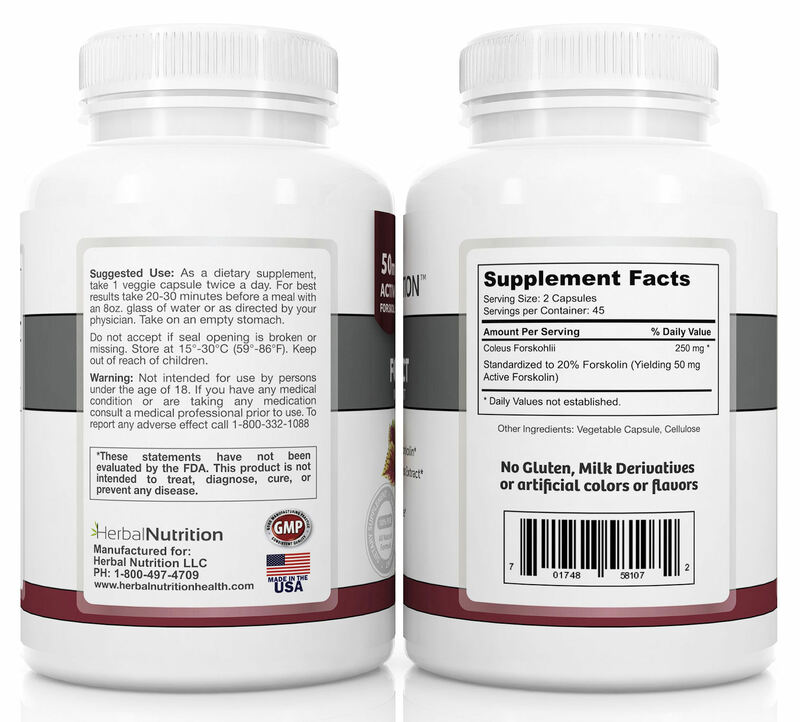 We developed the Herbal Nutrition Brand to deliver only the highest quality supplements and have helped thousands of people achieve their goals for more than a decade. Herbal Nutrition Quality 100% Guaranteed! For more information on how these product work see our individual product pages. Other Ingredients: Vegetable Capsule, Cellulose. No gluten, milk derivatives or artificial colors or flavors. Garcinia - For diet supplementation, we offer varying dosage recommendations, based on individual weight loss goals. When initially beginning a dieting program with Garcinia, we recommend starting with the Standard Diet Dose and adjusting up or down as needed. Maintenance Dose: Adults, take 1 capsule once daily, 30 minutes to an hour before food with a full glass of water, or as recommend by your healthcare professional. Standard Diet Dose: Adults, take 2 capsules once daily, 30 minutes to an hour before food with a full glass of water, or as recommend by your healthcare professional. Maximum Diet Dose: Adults, take 2 capsules twice daily, 30 minutes to an hour before food with a full glass of water, or as recommended by your healthcare professional. 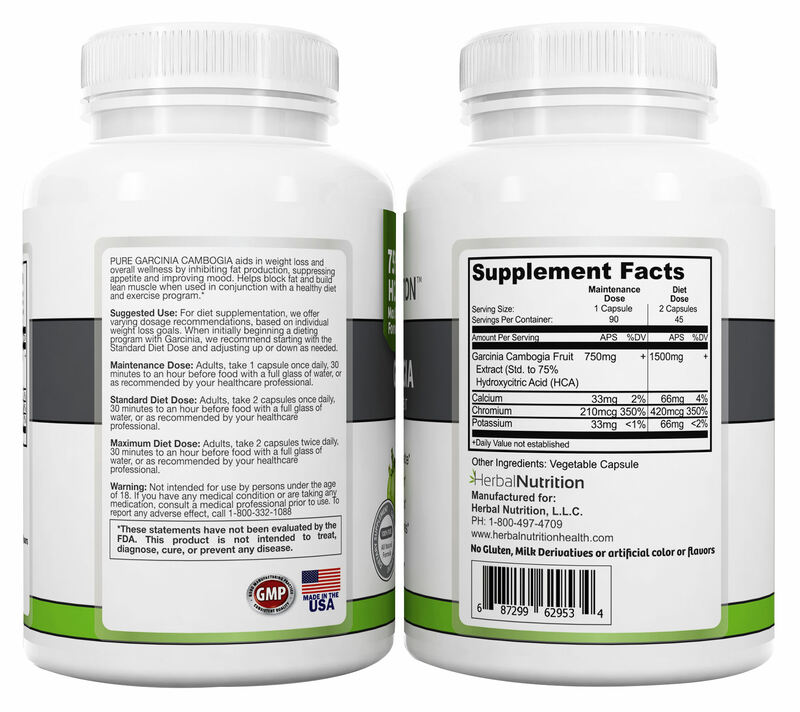 Forskolin - As a dietary supplement take 1 to 2 veggie capsule twice a day. For best results take 20-30 minutes befor e a meal with an 8oz. glass of water or as directed by your physician. Take on an empty stomach. No suggestions have been made for this product. You will earn 30 Reward Points Toward Free Product for purchasing this product.